Nothing can ruin a good romp around the woods (or the yard) like a run-in with poison ivy. If you’ve got poison ivy in your yard or garden or Gotham, chances are you’ve already experienced a rash or two and want to get rid of poison ivy plants as soon as possible — or you’re just thinking ahead, in which case, good for you smarty pants. The lack of itchy rashes is your reward! Getting rid of poison ivy plants is a delicate and time-consuming business. You need to be as thorough as possible, really get down in that dirt and dig, in order to stop the poison ivy from coming back. But you also need to protect yourself from the poison ivy while you work. Below we offer you tips on how to best get poison ivy out of your yard while keeping your body safe from a poison ivy rash. Poison ivy grows as a vine in some areas of the U.S. (East, Midwest, and South), and as a shrub in other areas (Northern, Western, around the Great Lakes). Poison ivy plants have three distinctive leaves by which they are most easily identified (see photos below). Know where to look for poison ivy in order to remove it from your lawn and garden. For help identifying the tell-tale three leafed poison ivy plant, see the photos at the beginning of this article. If you’re looking for the poison ivy growing in and around your yard, you’ll often find the plants growing around trees, along the edges of a field, open grass, or a road. Poison ivy will grow as a low ground cover, a free-standing “shrub” with one stem, and as a vine wrapping around standing objects (like trees). Get rid of poison ivy by removing the root system. The most important part of getting rid of poison ivy forever is to thoroughly eradicate the root system of the plant. 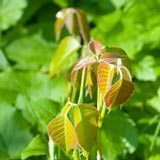 You can use numerous methods to kill the plant and remove the stems and leaves of the poison ivy plant, but you still need to pull out all of the roots to stop the plant from growing back and spreading elsewhere. Dig up the ground surrounding the plant and follow the root system to its end. Be sure to protect your skin even while handling the roots, and dispose of the poison ivy roots in a sealed bag, as you would the rest of the plant. This way some oil isn’t getting on your containers and causing rashes long after you’ve gotten rid of the plants. Smother poison ivy to stop it from growing. Cut back the above-ground leaves and stems of the poison ivy plant, then cover the area with a smothering agent, such as cardboard, newspaper, tarps, plastic, and mulch. Leave the area covered for long enough to kill the plant growth, then remove the remaining parts of the plant (including, especially, the roots). Remember that even the poison ivy is dead, it can still contain the toxic urushiol, and you handle all and dispose of all parts of the plant with protective care. You can get plastic sheeting from Amazon that can be used for this purpose. Herbicides are also an effective way to remove poison ivy. As with other weeds, you can use herbicides to kill the above-ground part of the plant, then remove the entire root system once the plant is dead. Roundup and Ortho Brush Be Gone products are generally recognized to be effective killers of weeds, like poison ivy. Herbicides are highly toxic, so it’s important to take the following precautions when using them to combat poison ivy: cover all of your skin, wear a breathing mask and safety goggles, never spray on a windy day (the chemicals can blow on to people, animals, and other plants), never use around children or animals, take care not to spread to other plants, store herbicides in tightly sealed containers, and always clean yourself, your clothing, and your equipment after use. Dispose of poison ivy in a safe way to stop it from growing back. Once you’ve cut down and uprooted poison ivy, it’s important to contain the plant to keep it from growing back or spreading the toxic urushiol oil. Use plastic bags to grasp the plant when uprooting it, and keep all parts of the plant in plastic bags and sealed disposable containters. Don’t mix poison ivy with other grass clippings or mulch and compost piles, don’t throw poison ivy plants in open garbage containers, and never burn poison ivy plants (this will release the urushiol oil into the air). Take every precaution you can to keep the plant from taking root again, stop the urushiol from spreading, and contain any loose seeds. You can keep poison ivy under control by mowing over the plants regularly. While this doesn’t actually get rid of the plant itself, mowing will keep the leaves from surfacing and spreading the toxic urushiol without you having to go through the work of uprooting the plant and disposing of it. Just be sure to take precautions not to touch the ivy while mowing, contain the mowed poison ivy in a sealed bag, and dispose of the clippings separately in a closed plastic bag. Organic herbicides are a natural alternative for getting rid of poison ivy. Some folks recommend spraying poison ivy with a saline solution to kill the plant. To use this method, mix a 3 to 1 solution of salt of soapy water and spray over the poison ivy stems and leaves. Wear a breathing mask and safety goggles to keep the urushiol out of your mouth, throat, lungs, and eyes. Don’t work with poison ivy on a windy day. The wind can spread unseen seeds to take root elsewhere. If you’re working with herbicides, wind can also spread the toxic chemicals to other plants and people. Keep all parts of the poison ivy plants contained to avoid unintentional contact later. Never, ever burn poison ivy. 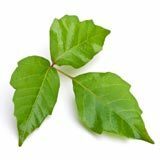 Burning poison ivy will release the urushiol into the air, which can cause severe allergic reactions on your body and in your nose, mouth, lungs, and throat.